The Tory graveyard poster – brilliant and shocking – cast a long shadow over PMQs today. The debate itself came down to fine judgements about the validity of the leaders’ arguments. Cameron demanded to know if Brown planned to introduce this grim levy or not. 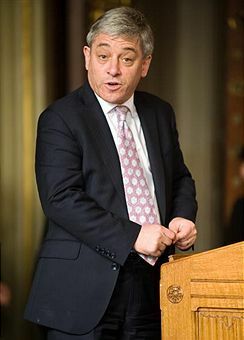 He quoted acidic comments from senior Labour figures who’ve called the tax ‘a cruel deception’, ‘badly costed’ and ‘poorly constructed.’ Brown’s response, which seems reasonable, is that the Conservatives ‘voted for this in the House and now they’re refusing to help us to give local authorities the resources they need.’ His plan was to turn the issue into a question of Tory inconsistency whilst taking swideswipes at the poster itself, which he clearly hopes will be banned. Cameron stuck to his point. A levy, yes or no? With the house growing raucous, the perky figure of Mr Berkow leapt up and asked everyone to stop shouting. He wanted to hear the debate, he said. But shouting doesn’t obscure the debate, it is the debate. A forceful orator can silence any crowd. Perky disagreed. ‘Far too much noise,’ he blustered like a prefect stopping a pillow fight in the dorm. Cameron had another go at Brown. ‘He’ll tell us about the benefits of the policy before the election, and the costs after the election.’ Nicely put. The Tories roared him on and Brown resorted to weary waffle about the Conservatives’ lack of policy and judgement. Nick Clegg brought up the issue of low-pay for the services. Brown was pleased to show his newly discovered warmth for the LibDems and he temperately indicated that he’d spent billions on the war already and had let servicemen off their council tax too. Flattered by these attentions, Clegg excused the PM the hot-headed lecture he likes to give him. Instead he asked a softly-softly question about cutting MoD bureaucrats. Watching these two parading their mutual esteem in public is becoming faintly sickening. The romance has all the pathos and sincerity of two teens snogging at a bus-stop. A couple of backbenchers stood out. Andrew Robathan asked Brown about the ‘fifty thousand pound slush-fund’ he denied all knowledge of at PMQs last week. Taut, curt and angry, Brown’s reply smacked of concealment. ‘All donations given to the Labour party,’ he seethed, ‘are reported by the Labour party not by me.’ Hardly a satisfactory reply. But the Tories have questions to answer too. Gordon Prentice asked why ‘a tax exile’ – code for Lord Ashcroft – was being allowed to ‘buy’ his marginal constituency of Pendle. Neutrals are baffled that this open wound is still bleeding. It gives Labour constant opportunities to tar the Tories as secretive and devious. Sure enough Brown launched into his ‘evasive Tory’ routine. His performance was steady today, if thoroughly predictable. Cameron was pretty good, though not quite excellent. Perky deserves a special mention. His refereeing was clumsy and his vocabulary continues to be as out-of-date as rationing. Nothing quite competes with his outfit though. Wearing the traditional ‘half a black curtain’ which he’s chosen as the Speaker’s official costume he kept bobbing up to remind us how little authority he projects. And that strange flappy Batman cape looks like the sort of garment you’d receive along with your on-line PhD certificate.